I recently attended the Greater Philadelphia Association of Realtors Annual Networking Breakfast, where I had the opportunity to hear Kevin C. Gillen, a Senior Research Fellow at Drexel’s Lindy Institute for Urban Innovation and the Chief Economist at Meyers Research LLC speak to the Q3 2015 Philadelphia housing market report. One of the points made during Kevin’s presentation that I found to be very interesting was that Philadelphia’s housing market operates as a laggard to the composite index. For example, as other markets may begin to flatten a bit, Philadelphia’s may continue to rise for a period before entering a similarly flat market. Philadelphia also sees a bit less volatility than other markets, so while our highs may not be as high as others, our lows aren’t as bad either. We may be considered more of a steady-eddy market. In the 3rd quarter, the march upward for housing prices continued, as all nine neighborhoods in the report showed increases. 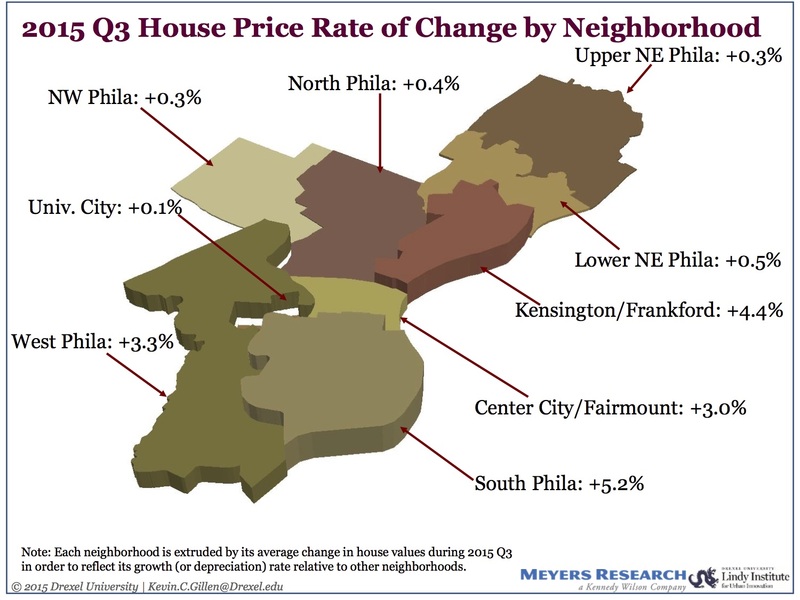 Of the nine, the most dramatic increases in the quarter were seen from South Philadelphia which had price appreciation of 5.2%, Kensington/Frankford 4.4%, West Philadelphia 3.3%, and Center City/Fairmount 3.0%.When looking at a breakdown of price appreciation over 10-years amongst the neighborhoods in the city, South Philadelphia with 36.3% and West Philadelphia with 28.9% lead the nine neighborhoods evaluated. Looking at the historical trends, it is understandable why so many have turned to real estate investment as a source of wealth creation. Beyond home price appreciation, by renting the home, you can establish a stream of cash-flow to help pay for costs like the mortgage, utilities, and maintenance. Renting is not without it’s risks, like poor tenant selection, deferred maintenance, and missing key identifiers of looming issues. With a high quality rental property management company, some of these risks can be hedged with their experience in tenant qualification, proactive maintenance, and regular property inspection. Many times, working with a high quality rental property management company may save you money, more than covering their fee. By selecting a high quality rental property management company, their experience may help to identify maintenance issues through inspection. Your rental property management company also works to monitor costs and tenant maintenance requests, allowing for early identification of potential issues and proper record keeping and accounting of repairs. Let us redefine your expectation of property management company. As a dedicated manager, all we do is property management. Property Management Redefined, this is how a property management company should be.